The landscape of the island has features that go far back into the past. “The ruined Broch of Burrian, now far eroded by the sea, and the solitary Standing Stone, posted like a sentinel midway between Gretchen Loch and Rinar’s Hill, present a double question mark,” wrote Peter A. Tulloch in his book A Window on North Ronaldsay in 1974. 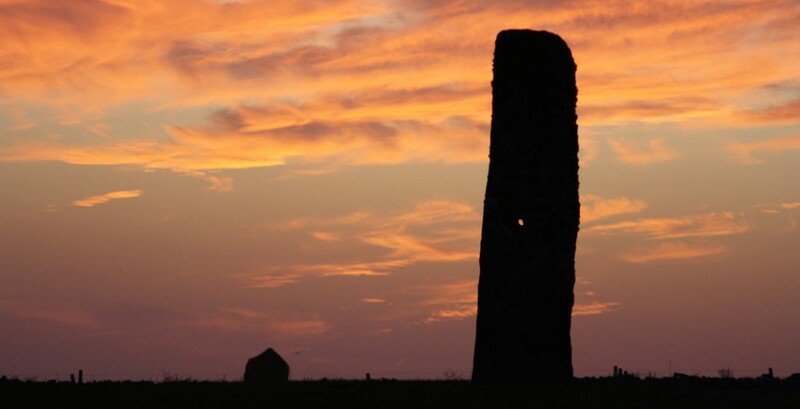 The Standing Stone goes back 5000 years to Neolithic times, the period when other great structures were erected along with western seaways of Europe, from the temples of Malta to Orkney sites such as the village of Skara Brae, the tomb of Maeshowe, and the stone circles of Stenness of Brodgar. A feature of many Neolithic sites is an alignment to sun, moon or stars, and the stone in North Ronaldsay has a small hole that the midwinter setting sun shines through. And strangely there was an old tradition in North Ronaldsay to gather at the Standing Stone on New Year’s Night, dancing round it to their own singing – a midwinter solstice setting. Certainly tradition has lasted a long time in the island. An 18th-century visitor spoke of a family which could trace its descent through 24 generations. In the same century an island minister read his parishioners a new poem by Thomas Gray, based on an Icelandic saga translation – to discover that they themselves knew the original, handed down in the island from saga times. The Broch of Burrian dates from the Iron Age, more than 2000 years ago. Brochs are found all over the north-west of Scotland, often by the sea and often in commanding locations. The tall towers may have been built by powerful people, who controlled the seaways, and they may have come to Orkney along the great seaway along the west of the British Isles. At times they may have quarrelled with each other, but the brochs seem to have all been within line of sight, suggesting that they could collaborate together against any external threat. When the broch was excavated in the early 1870s, evidence was found of a later Christian settlement on the site. There was a slab with an engraved cross – known as the Burrian Cross – and an iron bell. The next great wave of change for Orkney came from the north, when the islands developed as a staging-post on the trade route from Norway down to Dublin and beyond. An old story in the islands says that the Norse would tie up their ships on the Reef Dyke – today eroded to a long shoal. One source of information about the Norse era comes from the Orkneyinga saga, written in Iceland in the 13th century. 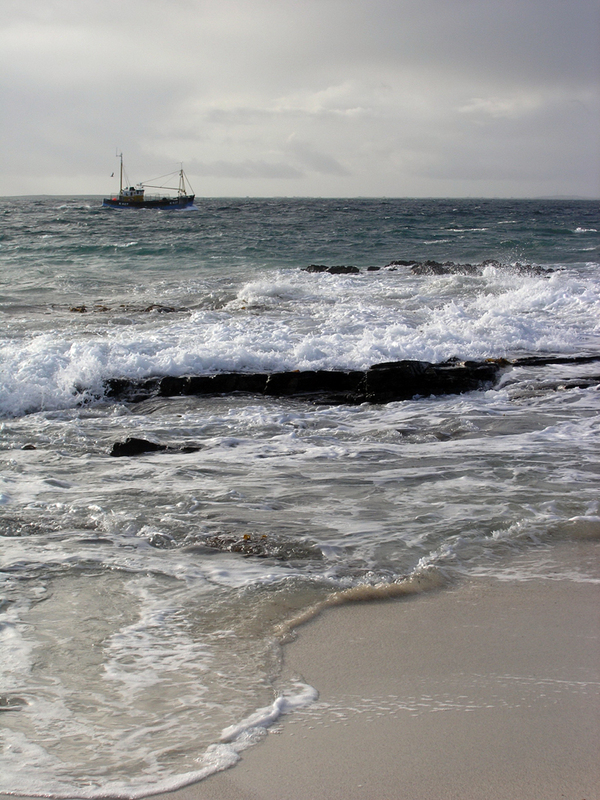 North Ronaldsay comes dramatically into one of the early sections of the story, where it tells how Earl Einar of Orkney fought a sea-battle against Halfdan Longleg, a son of the king of Norway who escaped and swam ashore on the island. Next morning the earl, who had only one eye, scanned the beach intently and saw the king’s son on the shore and landed and killed him. Some centuries later, the saga records a wise woman in the island, whose judgment was valued by Earl Rognvald, who built St Magnus Cathedral. She introduced him to an Icelandic poet, with whom he wrote several works. From the wealth of Norse trade, Orkney’s economy waned for some centuries, and its farming suffered from the harsher climate of the Little Ice Age, the years when in London the Thames froze and people lit bonfires on the ice. It was hard for a community that depended on subsistence farming, but in the late 1700s a new industry arose that generated employment for thousands of people across Orkney. The kelp industry involved gathering seaweed and burning it to ash. This was used as a source of soda and potash for glass, soap and dyes, and at a later stage for iodine. “North Ronaldsay was one of the communities most thoroughly organised for kelp-making,” writes the Orkney historian William P.L. Thomson, and the population in the island rose to above 500. Prices rose during the Napoleonic wars to boom levels, but the European peace after Waterloo saw competition from other countries, and a collapse in the kelp price in 1830 created a crisis for Orkney. The response from many of the land-owners was to invest in agricultural improvement. In North Ronaldsay, which had been bought by the Traill family in 1727, the laird took a radical decision to expand the potential grazing of the sheep by organising the building of the sheep dyke. The seaweed, no longer in demand for kelp, would be used instead to provide food for around 2000 sheep. The construction of the dyke was completed in 1832 and the pattern of sheepkeeping on the shore continues today.